June 9 (annual picnic) at 8:00 a.m.
Generally, the second Monday of each month. For more information, see the Meetings page. Since early February, a male Long-tailed Duck has been seen on the pond behind Hardee's in Verona. Since late December, a Loggerhead Shrike has been seen occasionally in the upland portion of Bell's Lane, hunting from small trees near the ponds. Due to a wave of spam attacks, this Web site feature has been disabled for the time being. Stay tuned for further announcements. 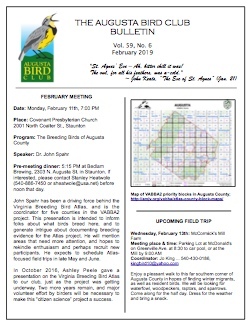 Augusta Bird Club members may submit rare bird sightings by using the Update page. For further information, or to report any unusual sightings, please contact the rare bird alert coordinator, Allen Larner. Please support and/or spread the word! Just click on the image above. 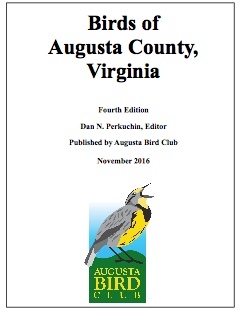 The 4th edition (2016), edited by Dan Perkuchin, replaces the 3rd (2008) edition Birds of Augusta County, which was edited by YuLee Larner. Our next "Birds & Brews, Wings & Wine" social hour will be: TBAat the home of Nancy Stevenson and Gil Nova, on Monday, October 29th. Thursday, August 23 at 6:00 PM at Plaza Azteca in Waynesboro. Thursday, June 28th, 5:30 p.m., at Table 44, located at 300 Church Street, near Sunspots Studio in Staunton. Sorrel's Lounge in the Stonewall Jackson Hotel, Staunton on March 26 at 6:00 PM. RSVP to Peter Van Acker by March 22. 6:00 PM on Tuesday, February 27 at the Depot at 42 Middlebrook Ave, Staunton. Please RSVP by February 26 to Peter Van Acker. Young people who are interested in applying for a scholarship to Nature Camp from the Augusta Bird Club can use the scholarship form. Reminder: membership dues are due! Those who have not yet gotten around to renewing their memberships in the Augusta Bird Club, please make a point to do so right away, using the 2019 Membership Form and sending your dues to the ABC membership chairperson Crista Cabe at the address shown on the form. Thank you! On Wednesday, March 20th five intrepid members of the Augusta Bird Club ventured out this first, frosty day of Spring to conduct a field trip to McCormick's Farm in Raphine, Va. The highlights of the trip included a Kestrel, Brown Creeper, Golden-crowned Kinglet and two Hermit Thrushes. A female Hooded Merganser was spotted on the entrance pond on our return trip from Willow Lake. 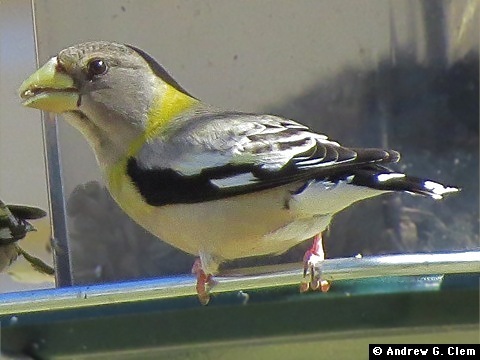 An "irruption" to the south of certain northern bird species has occurred this past winter, and during the past few months, a group of Evening Grosbeaks has made regular appearances in nearby Rockingham County. This species was once seen on a semi-regular basis during colder months in Augusta County, but is now considered a rare bird. Evening Grosbeak (female or immature male), at Union Springs in Rockingham County; March 16, 2019. Ann Cline recently traveled to Costa Rica, where she observed a wide range of tropical birds. A report on her trip, along with more photos, will appear in the April issue of the Augusta Bird Club Bulletin. 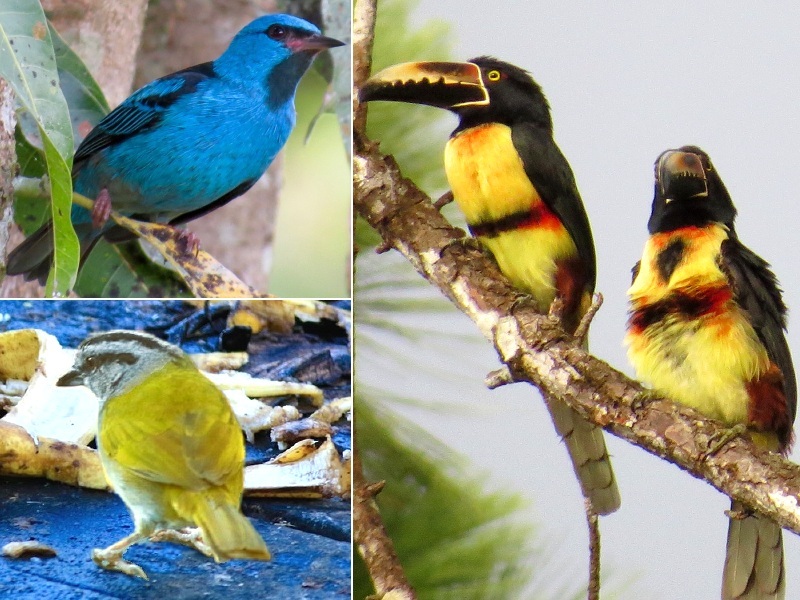 Blue Dacnis, Collared Aracari, and Black-striped Sparrow -- all seen in Arenal, Costa Rica in February; courtesy of Ann Cline. 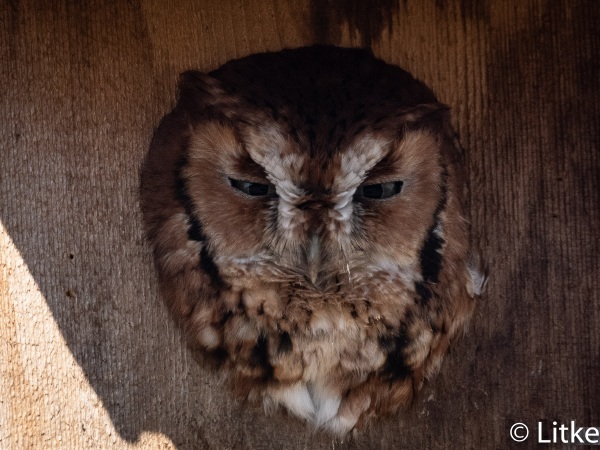 Screech Owl, north of Staunton, on Feb 27, 2019. Photo courtesy of Larry Litke. edited by Andrew Clem (since April 2016).